Addie Pearl (Winn) Sharp, 96, of Mooresville, passed away peacefully on August 12, 2018. She was born to Issac and Lola Jane (Howell) Winn on April 23, 1922 in Frankfort, MO. She married Harry Sharp on September 2, 1977. 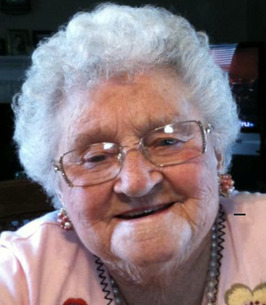 Addie is survived by four loving children, Wanda Lou Wolfe of Plainfield, James Martin Casey of Martinsville, David Eugene (Ronda) Casey of Indianapolis and Dennis Ray Casey of Indianapolis; 16 grandchildren; several great-grandchildren; one sister, Betty Jane Henry of IL; and a caregiver, Robert Malcolm. Addie is preceded in death by her parents; husband; a daughter, Linda Sue Johnson; a son, Ronald Lee Casey; a brother, Thomas Winn; and a sister, Stella Billings. Addie was a Waitress for Golden Corral in Plainfield for two years and Previously for Maupin Truck Stop in Plainfield for three years. She was a member of Mooresville Order of the Eagles. She loved dancing, cooking and going to garage sales. She has lived in Mooresville since 1987. Family and friends may show their love and support from 4-8 p.m. on Wednesday, August 15th at Jones Family Mortuary in Mooresville. Pastor Mark Wright will officiate Addie Sharp's celebration of life graveside service at 10:30 a.m. on Thursday, August 16th at White Lick Cemetery in Mooresville. To send flowers to the family of Addie Pearl Sharp (Winn), please visit our Heartfelt Sympathies Store. 13321 North White Lick Rd. We encourage you to share any memorable photos or stories about Addie. All tributes placed on and purchased through this memorial website will remain on in perpetuity for future generations.